No wonder it’s so hard for documents to escape the referral black hole. Why do some FOIA requests take decades to fulfill? The short answer is the concept of agency “equity” or ownership of documents, and the classification referral system. In sum, the current declassification system mandates that every agency that claims “equity” or asserts “ownership” of a document gets to review it before declassification. And just as they scramble for budgetary pork, agencies rarely see a document that they don’t attempt to claim “equity” over. It is this constant loop of “equity” claims and referrals that leads to our 400 million page backlogs and decades-old FOIA requests. Usually, this “referral merry-go-round” is hidden from the FOIA requesters—they just know their requests are in a black hole, not what’s happening to them in there. It wasn’t until the National Security Archive sued the Air Force that we knew why our FOIA request from 1997 remained unfulfilled for over a decade. Eventually, Federal Judge Rosemary Collyer ruled that the Air Force had “failed miserably to handle [National Security] Archive FOIA requests in a timely manner” and ordered the agency to fulfill the Archive’s long outstanding FOIA requests and appeals. Most revealing, she ordered the Air Force to present periodic status updates justifying why it was taking such a long time to fulfill Archive FOIA requests. Thanks to these status updates (here and here), we now have a chance to see what exactly happens to a FOIA request or appeal after it is submitted –and it’s not pretty. While this example is a bit dated –the Archive tries to litigate only as a last resort, and it’s rare for judges to explain step-by-step what is going on with requests in the black hole– the problems encountered by this FOIA request still exist today. In a status update for the litigation, the Air Force issued a ten-page report on its efforts to complete a 1997 request for 1969 documents about Minute Men ICBMs. After finally receiving a heavily excised response from the Air Force, Bill Burr appealed the agency’s decision. Below, we use the Air Force’s court-mandated status report to chronicle the appeal’s ugly journey –a journey including nine agencies claiming “equity,” constant miscommunication, delayed mail, lost documents, lapsed deadlines, and a general sense of indifference toward the FOIA requester. The status report shows that the US Air Force FOIA Office does not have the authority to declassify documents on its own. In the case of this appeal, the FOIA Office had to forward the appeal to nine additional agencies or components: the Department of Energy (DOE), the Department of Defense FOIA Office, the Joint Staff, the Air Force Space command (AFSPC), the Air Force Declassification Office (AFDO), Hill Air Force Base and US Strategic Command, and two (unnamed) intelligence agencies. Even less accountability was shown by one of the unnamed intelligence agencies. It told AF FOIA it had completed the appeal and would mail the response “within a few days.” AF FOIA never received the response and asked the intelligence agency to resend it. The intelligence agency did, but there was no document, only a memorandum. Months later, without hearing word, the Air Force FOIA office even attempted to initiate a “tracer action” for a document in the possession of the intelligence agency. But even this attempt to find the document was stymied when Air Force FOIA “did not receive any notification in connection with the tracer.” Finally, more than a year after the unnamed intelligence agency told the AF FOIA office that it would send its response “within a few days,” the AF received the unnamed intelligence agency’s review of the appeal. The Air Force refused to name the intelligence agency, presumably at the agency’s request to avoid accountability. USSTRATCOM had an especially hard time reviewing the appeal. It informed Air Force FOIA that could not meet its appeal deadline because “it was having difficulty determining what needed to be reviewed.” Between 2 July and 12 July, AF FOIA office contacted STRATCOM three times about the appeal, but received no response. Finally, in August 2010, STRATCOM completed its review. Completion of the appeal was further delayed when the Department of Energy –which had previously reviewed the documents—decided that the classifications of several portions of the documents needed to be changed because they included “Formerly Restricted Data.” This meant that these portions needed to be re-reviewed yet again. In the Air Force’s February 2011 court-mandated status update, it informed the Archive that its response to the appeal was finally “in the mail.” –Fourteen years after Bill Burr had submitted his initial request. 19 February 1997: Request originally filed. 7 July 2009: Air Force responds with redacted copy of documents. The Air Force FOIA office circulated the documents as a mass of pages without clearly marking where one document ended and another began. 4 August 2009: Air Force Headquarters FOIA OFFICE (HAF/IMIO) receives FOIA appeal from National Security Archive. 10 August 2009: Air Force (HAF/IMIO) forwards appeal to seven additional agencies: the Department of Energy (DOE), Department of Defense (DOD) office of Freedom of Information (OFOI) in the Office of the Secretary of Defense (OSD), the Joint Staff, the Air Force Space command (AFSPC), the Air Force Declassification Office (AFDO), and two (unnamed) intelligence agencies. 4 November 2009: the “second” intelligence agency provided a “mid-December” estimated completion date. 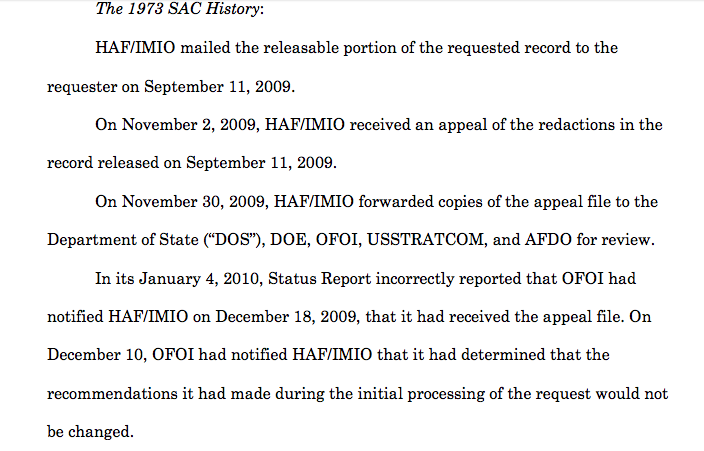 12 November 2009: HAF/IMIO received AFSPC review of appeal. AFSPC recommended the records be sent to Hill Air Force Base, Utah (Hill AFB) and United States Strategic Command (USSTRATCOM) for additional review. The appeal has now been tasked out to nine agencies. None have completed their review. On 24 February 2010, HAF/IMIO received the second copy of the “second intelligence” agency review –the first was apparently lost in the mail sometime after 16 December 2009. Unfortunately, only the “review memorandum” had been received, actual marked and reviewed copy was not. On 24 February 2010, Hill AFB stated it anticipated its response would be transmitted by the first week of March 2010. 23 March 2010: OSD and Joint Staff review received by HAF/IMIO. 16 April 2010: The “second intelligence agency” –which had previously claimed to have completed the review but had in reality only mailed a memorandum— “confirmed the estimated for completion.” This is despite having claimed to have already sent its appeal determination to HAF/IMIO. On 30 April 2010, Air Force counsel “determined he had inadvertently included information” from a separate appeal in Court mandated status reports. On 3 May 2010, OFOI indicated it did not have an estimated completion date for the records that DOE determined that it had to re-review because they may have FRD (Formerly Restricted Data). 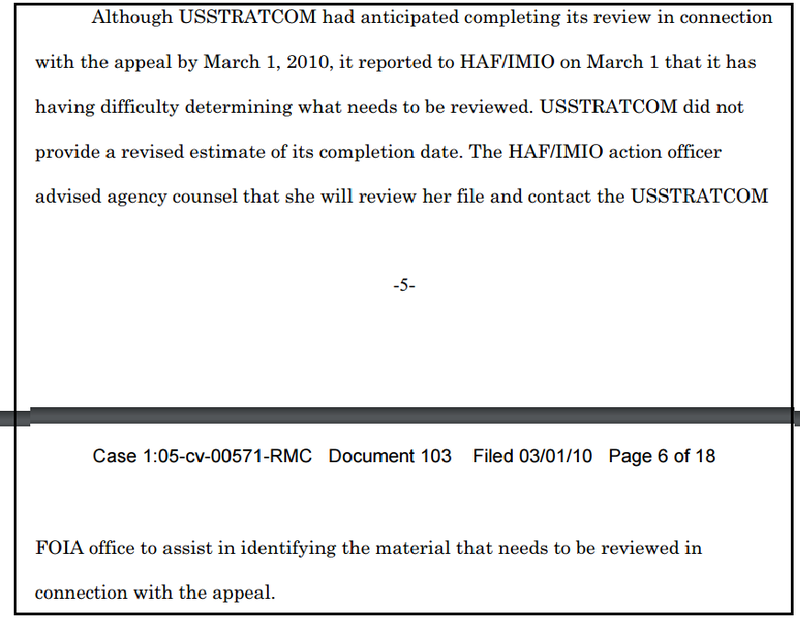 On 26 May 2010, HAF/IMIO stated she had “initiated a tracer action” on a copy of the responsive record possessed by the “second intelligence agency,” but had not “received any notification in connection with the tracer.” HAF/IMIO could not find part of the appeal file. 23 June 2010: USSTRATCOM pushed back its estimated completion date until 1 July 2010 because it may have had to use the Defense Currier Service which takes a longer time than the postal service. Between 2 July 2010 and 12 July 2010, HAF/IMIO contacted STRATCOM three times to determine the status of the request. Having been unable to communicate with STRATTCOM, HAF/IMIO “had the matter elevated” to OFOI. 29 July 2010: OFOI estimated that the additional review recommended by DOE would not be completed until 30 September 2010. 4 August 2010: STRATCOM completed its review of the appeal. 15 October 2010: The “second intelligence agency” stated it would send the appeal records during the week of 22 October 2010. On 30 December 2011 AFDO finally passed its appeal decision to HAF/IMIO. 7 February 2011: the National Security Archive finally received its documents. Since the Archive won the release of these documents, there have been some attempts to improve the referral and consultation process, but the fundamental inefficiency remains, as do decades-old open (page 30) FOIA requests, stuck in the referral black hole. The establishment of the National Declassification Center has had uneven success in cutting through the referral merry-go-round –for documents over twenty-five years old. Improvements that need to be made by the NDC include increasing its relatively low 59 percent declassification rate and ending its “wasteful, expensive” pass-fail page level review. As the Public Interest Declassification Board wrote, the NDC must understand that “clinging to manually-intensive [referral] processes diverts increasing dwindling resources …There must be an understanding and agreement that the current practice of having one, two or more persons conduct a laborious page-by-page declassification assessment for each record under review is an unsustainable practice.” Amen. In 2014 the Department of Justice Office of Information Policy issued guidance on “Referrals, Consultations, and Coordination”1 which clarified some ambiguities and suggested some potentially beneficial instructions including improved tracking, improved communications with requesters, and that an “agency receiving the referral [should] place the records in any queue according to that request receipt date.” Unfortunately in the National Security Archive’s experience these suggestions are all too frequently ignored by agencies. The Referral Black Hole keeps sucking requests in and rarely spits them back out.